The Center for Homeland Defense and Security (CHDS) sponsored the first State and Local Intelligence workshop at the Naval Postgraduate School (NPS) July 12-14. It was an opportunity for the NPS faculty, state, local and federal officials, law enforcement personnel, public health officers and members of the National Guard to discuss the latest developments related to intelligence for homeland security. The workshop allowed practitioners, academics, and other intelligence officials to network together and build interagency and intergovernmental relationships. The conference was designed to provide a forum for academics and practitioners to collaborate on issues and ultimately to produce a publication on intelligence that can be used by the broader national homeland security community. The event also enhanced the current homeland security curriculum by exposing the current CHDS students to the sophisticated debate and discussions that occurred during the conference. The workshop functioned as an introduction to a wide range of state and local intelligence issues. It was the first of its kind to address the link between state and local law enforcement, first responder communities and federal organizations, especially in terms of intelligence requirements, collection, analysis and reporting. Participants presented papers on a host of topics related to the entire process of producing finished intelligence for the broader national homeland security community. 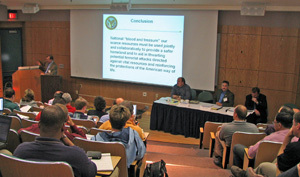 ”The lack of a universal, baseline understanding of state and local intelligence and NPS’ initiative to bring together an agenda and venue to address state and local intelligence issues is what makes this workshop unique,” said Robert Simeral, CHDS faculty. ”It [the workshop] was beneficial because we were able to explore new ideas from state and local practitioners,” said Joe Pfeifer, New York City Fire Department Deputy Assistant Chief and Chief of Counterterrorism and Emergency Preparedness. The ultimate goal of the conference is to produce an edited volume that can serve as the starting point for those interested in or practicing Homeland Security Intelligence, especially the emerging relationships and potential partnerships that exist between local, state and federal officials. The book is expected to be completed fall 2008. CHDS will continue to sponsor topical workshops on cutting edge homeland security issues to drive national debate and discussion amongst academics and practitioners. The next workshop will be on critical infrastructure protection slated for June 2008.